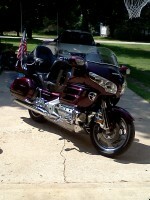 1982 Goldwing Motor for sale, 7,800 miles. Motor was running when I removed it from an '82 Interstate. Comes with everything but the Carbs and fuel pump. $400. Edit your profile in the user control panel to have your location. That might make a difference in getting a reply or not. It's not showing in the first post profile. OK, thanks. It shows on my computer in the upper right corner of the post. Location: Southern NH, home again! PM sent, Exhaust system is gone. Motorcycle: honda gl 1100 sc02, 1982.aspencade ONU. HELLO.l,m interested in the engine block 1100 gl. send you in ROMANIA? i would like to see a picture of this engine. thank you. dondons1984 wrote: still have the engine? da, sigur ma intereseaza. as dori sa vad poza cu acest motor. as vrea sa mai stiu si alte date despre motor. daca este complet, adica daca mai are pe blocul motor si carburatoarele, pompa de apa, bobinele de inductie,pompa de benzina. la 7,800 miles cred ca e perfect functionabil sau cel putin asa ar trebui sa fie. si sa-mi spuneti si cat costa motorul si cam cat ar costa transportul pana in romania. va multumesc. va dau si adresa meaca sa va puteti orienta in legatura cu pretul de transport. ROMANIA. JUDETUL CLUJ. ORAS CAMPIA-TURZII COD 405100. I think i just found your ad on another site! lol.. is this motor still available.. is your price firm? I blew my motor and i need help. I'm looking to spend about $200 plus shipping. I live in Albany, NY. It's quite a trek. email me at slydogjeff77 at g mail dot com and we can talk. thanks buddy.. hope to hear from you.